A certain Barry Sheene hung over pit wall holding the signal board that was going to herald a new chapter in the history of British Motorcycle racing. The GAS IT W….. message brought a smile to the face of his great mate Steve Parrish as he raced towards Copse corner on the last lap leading the very first British Grand Prix. It was an August afternoon in 1977 in these were incredible times and now the prospect of a British winner – it did not get any better than this, although perhaps a Sheene victory would have been the ultimate ending to the most perfect day. Since 1949 the British round of the World Championship had traditionally been held over the mountain circuit at the TT in the Isle of Man. The majority of the leading riders had stopped riding at the most famous motorcycle race in the world while even some of the National Federations had banned their riders from competing because they felt the 60.721 kms circuit was just too dangerous. We’d had our appetites whetted with many of the Grand Prix stars competing in lucrative international meetings at Silverstone, Brands Hatch, Mallory Park and even Cadwell Park but this was the real thing. At last after 28 years, the British round of the World Championship was on the mainland and the timing was perfect. Barry Sheene had already retained the 500cc World Championship, Barry and girlfriend Stephanie were the Beckhams of the seventies and featured on front pages and in magazines that would never have dreamt of even mentioning motor cycle racing and to make it the perfect day, Sheene was starting the race in pole position. To say Silverstone was buzzing would be a vast understatement. The so wanted Sheene victory did not materialise when the World Champion was forced to retire with mechanical problems but led by Sheene, the massive crowd switched their allegiance to his partner in crime Steve Parrish. Even after that there was a backup with John Williams, riding another RG 500 Suzuki in second place in front of Sheene’s team-mate and not great friend American Pat Hennen. Everybody was on their feet as Parrish raced between those towering grandstands at Woodcote to start the last of the 28 laps to re-write the history books both for himself and British Motorcycle racing, but don’t forget this was England in August. A few spots of rain spattered on Parrish’s visor as he turned his head to read Sheene’s typical message. Just 4.711 kms of the flat Northamptonshire countryside to negotiate and Parrish would win his first Grand Prix and would be crowned the very first winner of the British Grand Prix. The National Anthem and the Union Jack were being prepared at the podium, but it was the Stars and Stripes that would be required. Going into the first corner at Copse to commence the most important lap of his life, Parrish lost the front end of his Suzuki and went down. Before the crowd could hardly utter a moan, Williams crashed three bends later leaving the way clear for Hennen to win his second 500cc Grand Prix, little did we realise that Kenny Roberts was going to open the flood gates a year later. That was that. No British rider has won the premier class race at the British Grand in the next 41 years, the unfortunate Steve Parrish never won a Grand Prix and American riders dominated the Championship for the next ten years. By Nick Harris| 2018-08-23T12:35:11+00:00	August 23rd, 2018|News and Events, Nick's Blog|Comments Off on GAS IT W….. This is the ninth year that Silverstone has hosted grand prix racing since the motorcycle world championship series returned to the circuit in 2010 after a gap of 23 years. The first motorcycle grand prix event to be held at Silverstone in 1977 was also the first motorcycle grand prix to be held on the British mainland; prior to 1977 the British round of the world championship had been held since 1949 on the 37.73mile long Isle of Man TT circuit. The move from the Isle of Man was made mainly for reasons of rider safety. The winners at that first grand prix at Silverstone in 1977 were: 500cc – Pat Hennen (Suzuki), 350cc & 250cc – Kork Ballington (Yamaha), 125cc – Pierluigi Conforti (Morbidelli). The only three riders who have had more than a single victory at Silverstone since GP racing returned to the circuit in 2010 are Jorge Lorenzo, Marc Marquez and Maverick Viñales. Lorenzo has won the MotoGP race there three times: 2010, 2012 & 2013; Marquez won the 125cc race in 2010 and the MotoGP race in 2014; Viñales won the Moto3 race in 2012 and the MotoGP in 2016. Cal Crutchlow’s second place in 2016 was the first podium finish in the premier-class at Silverstone by a British rider since Ron Haslam finished third in the 500cc GP race in 1984. Yamaha have won four of the eight MotoGP races that have taken place at Silverstone, the last of which was three years ago with Valentino Rossi. In 2016 at Silverstone Maverick Viñales gave Suzuki their first MotoGP win since Le Mans in 2007 when Chris Vermeulen won the wet French GP. This was also the first podium finish at Silverstone in the MotoGP era for Suzuki and the first win for Suzuki at Silverstone since Franco Uncini won the 500cc race at the British GP in 1982. Last year Andrea Dovizioso gave Ducati their first ever grand prix victory at Silverstone. Honda riders have qualified on pole in the MotoGP class at Silverstone for the last seven years. The only non-Honda rider to start from pole at Silverstone in the MotoGP class is Jorge Lorenzo on a Yamaha in 2010. In the last six years the only rider to win the MotoGP race at Silverstone from pole position is Marc Marquez in 2014. Only three British riders have started from pole at Silverstone, across all solo GP classes; Barry Sheene in the 500cc class in 1977, Sam Lowes in Moto2 in 2015 & 2016, and Cal Crutchlow in the MotoGP class in 2016. The eight Moto2 races that have taken place at Silverstone have been won by eight different riders: 2010 – Jules Cluzel, 2011 – Stefan Bradl, 2012 – Pol Espargaro, 2013 – Scott Redding, 2014 – Tito Rabat, 2015 – Johann Zarco, 2016 – Tom Luthi, 2017 – Takaaki Nakagami. None of these riders are competing in the Moto2 class in 2018. Six different riders have won the six Moto3 races that have taken place at Silverstone: 2012 – Maverick Viñales, 2013 – Luis Salom, 2014 – Alex Rins, 2015 – Danny Kent, 2016 – Brad Binder, 2017 – Aron Canet. 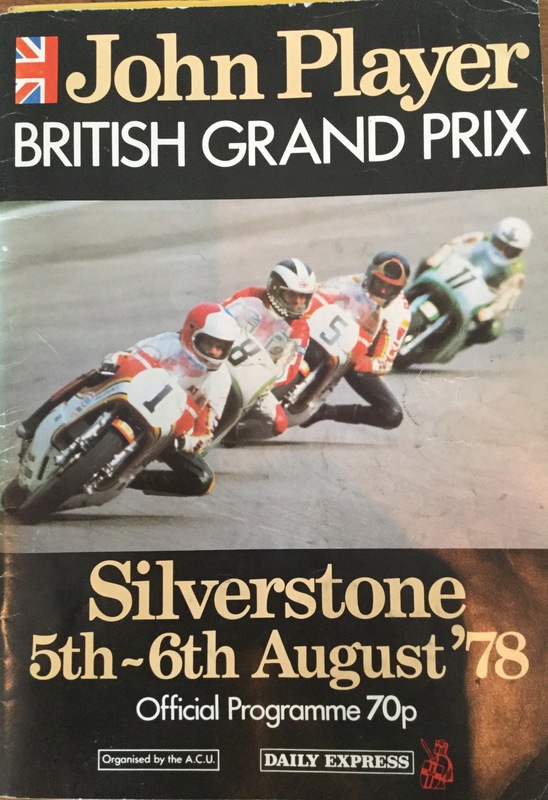 Like the huge number of other British motorcycle grand prix fans (the term MotoGP had not been thought up back then) I arrived at Silverstone in 1978 optimistic that I would see a British rider take the honours in the 500cc race, then the premier-class of grand prix racing. The first World Championship Grand Prix to be held on the British mainland was one year earlier at Silverstone. From 1949 to 1976 the famous Isle of Man TT races had counted towards the world championship classification and had been the British round of the series. That first year at Silverstone in 1977 I returned home disappointed after my racing hero of the time, Barry Sheene, who had dominated the world championship for two years, suffered a mechanical failure after starting from pole. The terrible day for the British riders was compounded when both Steve Parrish and John Williams crashed in the closing stages when leading the 500cc race in slippery conditions after a few spots of rain. 1978 of course saw the arrival of Kenny Roberts, and in his debut year competing in the world championship, he arrived at the penultimate race of the year with a slender three point advantage. If Sheene could win the race at Silverstone then at worst he would arrive at the final race of the year in Germany level on points (in those days it was 15 points for a win and 12 for second place). The race started under a threatening sky and predictably the rain started to fall before mid-race distance. I don’t think it overstates matters to say this caused chaos! To give a bit of background, slick tyres had only appeared on the scene a few years prior to this race, together with wet weather and intermediate tyres. However, the rule makers had not caught up with these changes and no one knew what to do in this situation where the race started in dry conditions, then rain started to fall during the race. After a few laps wobbling around in treacherous conditions on slick tyres the riders eventually streamed into pit lane. But one rule that did exist back then was that riders could not change bikes during the course of the race, so the only alternative was to change wheels and tyres. This is where the pit crew of Kenny Roberts, headed by 1969 250cc world champion Kel Carruthers, won the race. During the early parts of the season Roberts had been supplied with only one bike from Yamaha, which meant that in order to test tyres during practice the crew has become skilled in quickly changing the wheels. So at Silverstone they had the rider out on the track again with full rain tyres in less than 3 minutes. However, the Sheene pit crew took more than 7 minutes to get the wheels changed. Once back on track Barry Sheene demonstrated his mastery of the wet conditions, lapping much faster than any of his rivals. But it was in vain and he could not make up the advantage gained by Roberts in the pit stop. While all this was going on, one of the British “wild-card” riders Steve Manship had “thrown the dice” and started on intermediate tyres. He took the lead of the race when everyone pitted, and came close to taking the win, but was passed by Roberts on the final lap. Sheene came home third, after his heroic efforts took him to just over a minute behind Roberts. So that is why I say this race was the first flag-to-flag, before the term was even invented! In fact, it was a real flag-to-flag because the riders finished on the same bikes they started the race. So for the second year the Silverstone crowd had been denied a British winner. It will not be a surprise if there is inclement weather this year at Silverstone, but let’s hope that it does not stop a British rider winning the MotoGP race and sending the fans home happy. This is the ninth Grand Prix at Silverstone since it returned to the circuit in 2010. However, Silverstone had hosted the British round of the world championship on ten previous occasions from 1977 to 1986 and below is a brief recap of what happened in those years. 1977 – This was the final race of the season and British hopes were high for a win in the 500cc class by a home rider, with reigning champion Barry Sheene qualifying on pole on his factory Suzuki. However Sheene retired with mechanical problems on lap nine. This left the door open for team-mate Steve Parrish to lead the race into the closing stages only to crash in the closing stages of the race. Fellow Britain John Williams then moved into the lead before he also crashed out. Finally the third factory Suzuki rider, American Pat Hennen, took the victory. Kork Ballington had a double victory in the 350cc and 250cc classes on his private Yamaha machines and in the 125cc race, Pierluigi Conforti took his only ever GP victory. 1978 – The 500cc GP ended in chaos, after rain started to fall mid-way through the race. With no specific rules to deal with such a situation, the riders had to enter the pits to change tyres. Barry Sheene (Suzuki) was by far the quickest rider after the tyre change but suffered with a pit stop that took over 7 minutes. By contrast the eventual winner Kenny Roberts (Yamaha) was in the pits for less than 3 minutes. Splitting these two riders on the podium was Britain’s Steve Manship, who had gambled on starting the race with intermediate tyres. Kork Ballington (Kawasaki) won the 350cc race from British riders Tom Herron and Mick Grant. Toni Mang scored the first of his record 33 victories in the 250cc class, with Herron once again finishing second. Angel Nieto won the 125cc race riding a Minarelli from British rider Clive Horton. 1979 – The two top riders of the day, Barry Sheene and Kenny Roberts, exchanged the lead throughout the 500cc race. Roberts eventually took the win by 0.03 seconds in one of the closest finishes of all-time. In the 250cc race Morbidelli factory rider Graziano Rossi (Valentino’s father) fell on the final lap of the race when holding a two second lead. Kork Ballington (Kawasaki) took advantage of Rossi’s misfortune to win the race and then did the double by winning the 350cc race. Angel Nieto repeated his 125cc victory of the previous year. 1980 – After a great battle early in the 500cc race, Randy Mamola (Suzuki) pulled clear of fellow American Kenny Roberts to win the race with Marco Lucchinelli finishing third and Graziano Rossi finishing fourth. Toni Mang (Kawasaki) won the 350cc race and Kork Ballington (Kawasaki) was once again victorious in the 250cc class. In the 125cc class Loris Reggiani (Minarelli) took his first ever Grand Prix win. 1981 – The edge was taken of this race as early as the third lap when race leader and pole position man Graeme Crosby crashed and took out Barry Sheene and forced championship leader Marco Lucchinelli into the catch fencing. Dutchman Jack Middelburg (Suzuki) went on to win the race from Randy Mamola and Kenny Roberts. This was the last time that a premier-class GP race was won by a true privateer rider. Toni Mang (Kawasaki) won both the 350cc and 250cc race. The home crowd were given something to cheer with Keith Huewen finishing second in the 350cc race. Angel Nieto (Minarelli) won in the 125cc class at Silverstone for the third time. 1982 – Barry Sheene had a huge crash in practice that eliminated him from the 500cc race and Kenny Roberts’ race was short lived with a crash at the first corner. With his two main challengers out of the race, Franco Uncini (Suzuki) cruised to a comfortable victory which effectively sealed the world title. Jean-Francois Balde (Kawasaki) won a tremendous 350cc race and Martin Wimmer (Yamaha) won the 250cc race from pole having crashed out of the earlier 350cc race which he also started from pole. Angel Nieto won the 125cc race once again – this time riding a Garelli. 1983 – The 500cc race was run in two parts, after the race had been stopped due to a big crash in which Norman Brown and Peter Huber lost their lives. Kenny Roberts took overall victory from great rival Freddie Spencer with Randy Mamola making it an all USA podium. There was an historic win in the 250cc race with Jacque Bolle giving Pernod their one and only GP victory. Angel Nieto won the 125cc race at Silverstone for the fifth time. 1984 – Riding as a replacement for the injured Freddie Spencer, Randy Mamola won first time out on the V-four Honda from fellow American Eddie Lawson and British rider Ron Haslam. Christian Sarron (Yamaha) won the 250cc race on the way to taking the world title and Angel Nieto won the 125cc race and in doing so clinched his 13th and last world title. 1985 – In horrendously wet conditions, Freddie Spencer (Honda) won the 500cc race after finishing fourth in the earlier 250cc race to clinch the world championship title. British rider Alan Carter had led the 250cc race until mid distance before crashing and re-starting to finish seventh. Toni Mang (Honda) took the 250cc race victory from Reinhold Roth and Manfred Herweh in an all German podium. Austrian rider August Auinger (Monnet) won the 125cc race. 1986 – As in the previous year, the event was held in terrible wet weather. Wayne Gardner (Honda) had a start to finish win in the main race after starting from pole position. Winner of the 250cc race was Dominique Sarron (Honda) – brother of the winner of the race in 1984. Alan Carter crashed out of the 250cc race once again; this time on the last lap while challenging for the lead. August Auinger (Bartol) repeated his 125cc win of the previous year. History was made in the 80cc race held in the dry weather on Saturday, when Ian McConnachie (Krauser) became the first British rider to win a Grand Prix race for solo motorcycles around the Silverstone circuit. I wondered just what Ross Brawn thought at the Red Bull Ring on Sunday as he watched the epic duel between Jorge Lorenzo and Marc Marquez exchanging paint schemes in their fight for victory. The very accomplished and highly experienced Brawn is widely acclaimed as the man to bring the fizz and excitement back to four wheels and Formula One. Hopefully he enjoyed the racing and I’m sure did not need reminding that when it comes to the real crunch, it’s the actual racing out on the track that is the key to success. You can introduce brilliant technical innovations, clever rule changes to try and ensure closer racing and have every well-known celebrity in the world filmed on the starting grid but it’s the action on the tarmac that gets the adrenalin flowing through the veins of both the crowds and commercially probably more important, the television audiences. Ninety-two thousand fans in the Austrian sunshine embraced just what MotoGP™ is all about. Flag waving, flare burning and vocal, they just loved everything that MotoGP™ had to offer in a day of noise, excitement with rivers of adrenalin flowing while the riders played their part as always. Superb Moto3™ and Moto2™ contests were the ideal dessert for the MotoGP™ race and Lorenzo and Marquez did not let us down with a head to head confrontation. You could not write the script with the two Spanish World Champion team-mates at Repsol Honda next year. This season, or the last few seasons I have been lucky to witness, have made me a little bit selfish because I was disappointed there were no records broken in the MotoGP™ race on Sunday. The closest ever top ten premier class finish in the 70-year history of the sport at the previous round in Brno. Just 8.3 seconds separated that top ten while just a couple of rounds earlier the closest ever top 15 finish. In Assen it was 16.04s that elapsed between the winner Marc Marquez and 15th placed Dani Pedrosa, crossing the line after a breathless 25 laps of the Cathedral. Of course, I was not disappointed on Sunday because you need not look further than those two at the front fighting for the lead to provide enough excitement and anticipation to keep you going until they reach Silverstone in two weeks’ time. When Formula One visited the Red Bull Ring earlier in the season just the three leading cars finished on the same lap of the 71-lap race, but one thing they produced that MotoGP™ has not done for 28 barren years was a Dutch winner. Instead of the Rossi or KTM flags filling the hillsides it was Dutch orange of Max Verstappen. I waited 35 years for a British Premier class winner and hopefully those loyal Dutch fans will remain that patient. In the meantime, enjoy that racing because when it comes to the crunch, that’s what really counts. Of course, riders worry about the weather before they go into battle but at the Austrian Grand Prix in the eighties, it was not rain or high winds that caused furrowed brows before the visors dropped. Snow and really thick snow was the problem. The MotoGP™ riders looked up at the darkening sky as clouds amassed over the grid on Sunday – would the weather play yet another vital part on the 21-lap proceedings round the 5.403 km circuit that snaked its way through forests on its undulating journey up and down the hillside overlooking the city of Brno. This time those black clouds did not drop their contents and the asphalt remained dry throughout. Next Sunday the riders will once again cast a wary eye over those magnificent mountains that surround the Red Bull Ring as they line up for the Austrian Grand Prix. Just ask anybody who was there in the nineties if it can rain, I promise you it can and very hard but snow in August, surely not a chance. The Salzburgring was a magnificent venue but I didn’t have to race a fearsome 500cc two-stroke round the 4.240 km frighteningly fast undulating track that staged the Austrian Grand Prix 22 times. Magnificent scenery in the foothills above the city of Salzburg. A mountain stream ran through the tunnel that led you into the paddock and you’d walk alongside another stream that followed the wooded path to the start and finish line and the communications hut that was staffed with an iron fist by the apply named Fax Family who were very easy to upset, which we often did. We stayed in a great hotel in the lakeside village of Fuschl Am See, which is now the home of Red Bull. They not only understood why you needed to be on the phone at reception for a couple of hours to relay the race story back to England but would keep a supply of apple strudel and beer to keep you going on a yet another long Sunday night. Marlboro would stage a magnificent dinner usually hosted by Giacomo Agostini at the superb hotel half way up the mountain overlooking Salzburg before practice got underway on Thursday night. So, a great place to work and spectate but it was the timing of the race which often was the first Grand Prix of the season that spoilt our fun. The Venezuelan Grand Prix had already been cancelled in 1980 because of financial problems and so Austria was due to start the new season on April 27th. Spring it may have been but some unseasonable thick snow – even for this part of the world – not only prevented riders actually tracing the outline of the circuit in the blizzards but blocked any chance of the trucks and motorhomes getting into the paddock. The first race of the season moved onto Misano in Italy two weeks later where Kenny Roberts was a comfortable winner. You would have thought they had learned their lesson but a year later on the same weekend practice had to be delayed for the opening Grand Prix of the season. You guessed it, because of the snow. Although the race won by Randy Mamola did take place. Never say never but with Europe frying in the summer sunshine, the last thing on the riders mind lining up for the Austrian Grand Prix as Ducati chase a hatrick of victories will be snow. Motorcycle Grand Prix racing returned to Austria in 2016 after a break of eighteen years. In 2016 Austria staged a motorcycle grand prix event for the first time since 1997. The first Austrian grand prix took place in 1971 at the Salzburgring circuit, which hosted grand prix racing on a total of 22 occasions. At that first Austrian GP in 1971 Giacomo Agostini (MV Agusta) won the 500cc race, finishing more than a lap ahead of second place finisher Keith Turner. Agostini also won the 350cc race, with the other classes being won by the following riders: 250cc – Silvio Grassetti (MZ), 125cc – Angel Nieto (Derbi), 50cc – Jan de Vries (Kreidler). Due to the high speed nature of the Salzburgring circuit, and the limited amount of run-off provided, it was considered too dangerous for continued use for grand prix racing. The current circuit has hosted two previous grand prix events prior to 2016 – in 1996 and 1997, when named the A1-Ring. Prior to 2016 Valentino Rossi was the only current rider to have to have raced previously at this circuit in a grand prix. Rossi’s third place finish in the 125cc race in Austria in 1996 was his first GP podium finish. He again finished on the podium in the 125cc race in Austria in 1997, this time in second place just 0.004 seconds behind Noboru Ueda. Two years ago in Austria Andrea Iannone won for the first time since he moved up to the MotoGP class in 2013 and gave Ducati their first win since Casey Stoner won the Australian GP in 2010. Ducati have won both MotoGP races held at this circuit, with Iannone in 2016 and Dovizioso last year. The Red Bull Ring is the only circuit on the current schedule (that has been used previously) where Marc Marquez has not had a MotoGP victory. The Red Bull Ring is one of only seven circuits where Ducati have won in successive seasons, along with Brno, Donington, Losail, Motegi, Phillip Island, Sepang. The Austrian GP in 2016 gave Ducati their first one-two finish in a MotoGP race since the Australian GP in 2007, won by Casey Stoner from Loris Capirossi. The Austrian race in 2016 was the first time that Italian riders have taken the top two places in a premier-class GP both riding Italian bikes since the Finnish 500cc GP at Imatra in 1972 won by Giacomo Agostini, on a MV Agusta, from team-mate Alberto Pagani. The average speed of the MotoGP race in Austria last year was 182.6 km/h, the highest average speed for a grand prix race since Mick Doohan won the 500cc German Grand Prix in 1994 at the Hockenheim circuit at an average speed of 203.8 km/h. Tenth place finisher at the Czech GP, Andrea Iannone, crossed the line just 8.326 seconds after race winner Andrea Dovizioso. This is the closest top ten of all-time in the premier-class of grand prix racing, in a race that has gone full race distance. This illustrates what great racing there is in MotoGP at the moment, with three of the opening ten races of 2018 appearing in the above table. Yes, my very first visit to Brno did teach me about life behind the Iron Curtain, just how dangerous the old road circuit was, keeping your thoughts to yourself when queuing for hours between the machine gun posts to cross the border from Austria, that sidecar driver George O’Dell was the contact for the cheapest crystal glasses, Russian champagne tasted ok and how to drink tea without milk. Far more important than any of these great experiences though, it taught me you must pick the right moment to ask a difficult question. South African Jon Ekerold was quite simply the hardest motorcycle racer I’ve ever met. He’d arrived at Brno with a massive chance of clinching the 1980 350 cc World Championship he so richly deserved after a season long battle with Toni Mang. It was the penultimate round and he led Mang by 14 points as they lined up for the 13-lap race round the 10.920 km road circuit. Typically, Jon had taken everything fate could throw at him. His two mechanics Gregg Irvine and Keith Petersen had been barred entry to the communist country because of their South African passports and Jon had only obtained the necessary visa using the Norwegian passport he’d inherited from his father. He was the privateer of all privateers riding the Yamaha based Bimota twin and started on the front row as they prepared to race between the houses and through the cornfields. I was already planning the words of my World Championship winning story as Jon was happy to sit behind leader Mang with just a few forays to the front to keep the chasing pack at a safe distance. Six laps to go and I’d already written the headline ‘The Privateer of all Privateers’ when it started to go horribly wrong. Jon started to slow with a broken piston ring as Mang piled on the pace at the front. With a lap to go he was still the 1980 350 cc World Champion in third place but his pace was that of a Tour de France cyclist not of a Grand Prix motorcycle racer. The snarling pack picked him off one by one and he limped across the line in tenth place with a single World Championship point. Eckerold and Mang would arrive at the Nurburgring seven short days later equal on points. Up stepped the new reporter in his first Grand Prix season. As a shattered Ekerold coasted to a halt in the paddock, there was an ominous silence as he took off his helmet. Everybody realised this was not the exact moment to speak and certainly ask questions, apart from a person proudly wearing his Motor Cycle Weekly t-shirt. To say he was not happy with my enquiry about what had gone wrong would be a vast understatement. I rightly got the works from a man that had dedicated his life to winning the World Championship. On a scorching hot afternoon in Czechoslovakia, that dream had disappeared in the heat haze. Fast forward five days and as I walked into the Nurburgring paddock for the final showdown, Jon Ekerold was waiting for me at the gate. Nervously I walked up to him expecting another deserved outburst but before I could speak he put out his hand and apologised for his anger, which he told me was unjustified and unfair to somebody who was only trying to do his job. What a man and I was able to write the Privateer of all Privateers story on Sunday afternoon when he beat Toni Mang in an epic encounter round the old road circuit to bring that 350 cc World title to South Africa. Thanks Jon, it’s a lesson I’ve never forgotten.